Anyone hoping for a goalie duel was sorely disappointed as the starters yielded nine goals in just two periods and both clubs put in their backup in the second half of the game. The final frame saw Texas yield four goals as a game filled with penalties caught up with Texas' legs in the third. "We fell back into what was hurting us in that stretch where we couldn't find our game," said Brandon DeFazio, who had two goals in the game. "Taking untimely penalties makes it harder than it needs to be." The game was a seesaw affair with neither club leading by more than a goal until the last period. 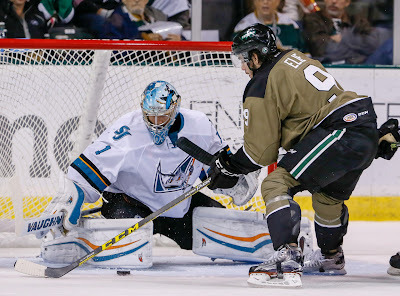 Texas took 48 minutes of penalties including two misconducts, leading to nine power plays for the visiting Barracuda. "When you get into penalty trouble, you're going to pay for it and we paid for it tonight," said Texas head coach Derek Laxdal. "It caught up with us in the third. We took at least 10 or 12 minutes of undisciplined penalties and you're not going to win in any league with that." The Stars have taken a more physical tone to their game this season but are having difficulty riding the line between aggressive and delinquent. "There's a difference between selfish undisciplined penalties and undisciplined penalties. When you embarrass the ref and embarrass the ice attendants during the whistle, that's selfishness. You have to learn to battle through that." Laxdal was referring to a second period penalty on Julius Honka that put him in the box for a misconduct for abuse of officials, a tough blow when the Stars were already down a defenseman after Mattias Backman was injured blocking a shot. San Jose opened the scoring late in the first on a two-man advantage. Texas answered right back with Brandon DeFazio re-igniting his offense, earning his fourth of the year, off a fantastic drop from Remi Elie. Early in the second, San Jose regained their lead only to see it erased 34 seconds later by rookie Mike McMurtry's second goal in as many games. Barclay Goodrow evened things up at two within a few minutes and the offense was out in force. Travis Morin dished a perfect pass to Brendan Ranford, who was camped in the slot on the power play, for an easy tap-in goal. Dustin Stevenson scored just 38 seconds later, a soft goal from the point. Tim Heed scored his first of the year on a power play only 25 seconds further. That goal would end Maxime Lagace's night and bring in Philippe Desrosiers. "I was trying to get [Maxime Lagace] into a groove because I thought he played well last night to get the back to back start." DeFazio tossed in his fifth of the year shortly thereafter to cap four goals in 89 seconds between the two teams. The third period was all San Jose as they doubled their goal total in the frame. The fifth goal rolled down Desrosiers' back and in while the sixth, and eventual game-winner, was a deft tip from Timo Meier. Two empty net goals would cap the evening. "We were trying to make the simple plays and sitting back a little too much," said DeFazio, referring to the Stars' third period play to protect the lead. "You want to win the game and not be the guy to give something up." Texas only managed four shots in the period, and Troy Grosenick, who replaced starter Mantas Armalis to start the third, got the win. The Stars now have a break until Wednesday when they start a midwest swing with a game in Grand Rapids. Mattias Backman was injured in the second period blocking a shot. Coach Laxdal is hopeful he will be ready for Wednesday game in Grand Rapids.